This result not only acknowledged the unique aura and design of the new Mercedes-Benz SLS AMG, whose gullwing doors evoke memories of the legendary 300 SL “Gullwing” sports car of the 1950s, but also its technical sophistication. The super sports car excels with its uncompromising lightweight construction, superior driving dynamics and exemplary safety. These attributes are ensured by a unique technology package consisting of a lightweight aluminum spaceframe body with gullwing doors, the AMG 6.3-liter V8 front-mid-engine with dry sump lubrication, a peak output of 420 kW/571 hp and 650 newton meters of torque, a seven-speed double-declutch transmission in a transaxle arrangement and a sports suspension with aluminum double wishbones. This combination guarantees dynamic performance at the very highest level. The ideal weight distribution of 47:53 percent between the front and rear axles, as well as the low centre of gravity, further enhance this thoroughbred sports car design. The SLS AMG accelerates from zero to 100 km/h in 3.8 seconds, and has a top speed of 317 km/h. 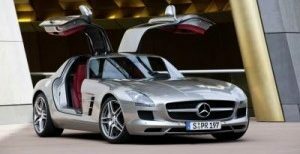 The SLS AMG can be ordered from Mercedes-Benz own-retail outlets and dealerships in Germany from 16 November 2009. The purchase price is 177,310 EUR (incl. 19 % VAT); the market launch commences in spring 2010. The new Gullwing model is continuing a fine tradition in winning the “Golden Steering Wheel” award: with a total of 18 victories to date, Mercedes-Benz is among the most successful car brands in the competition for the “Golden Steering Wheel”.